It's always a measure of a band's popularity when it books the same venue a few times for a residency - now it's the turn of Brooklyn-based The National to affirm their superiority, with a trio of dates at Brixton's Academy in the autumn as part of their UK tour. Having already announced dates in Bristol, Coventry, Glasgow and Manchester, the band will set up camp in Brixton from Monday 29th November until 1st December, the latter having already sold out as well as the regional gigs. Tickets for the new Monday date are now on sale and cost £21.50 plus fees - and they are sure to sell out just as quickly. 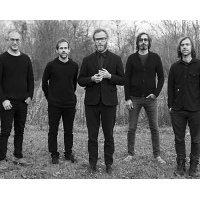 The National have been busy plugging the Top 5 album, "High Violet", at various festivals with Ireland's Electric Picnic the only other Ireland/UK related date to see them this year, before they hit numerous other festivals across Europe and North America. Apart from the album, their only other recent artistic contribution has been a contribution to the award-winning US-documentary film, "Racing Dreams" - three youngsters race for a place in NASCAR history and a place at the Daytona 500. The DVD is due out over here later this year. Tue 6th Aug 2019 The NationalKelvingrove Park (Glasgow)More Info..